Since 1978, Fobzu has been working to promote the advancement of Palestinian education under occupation and in exile. Over the past 40 years, Fobzu has furthered the cause of Palestinian education by raising awareness in the UK about the needs of Palestinian students and academics and their struggle, supporting educational projects and providing scholarships and bursaries to students in financial need. 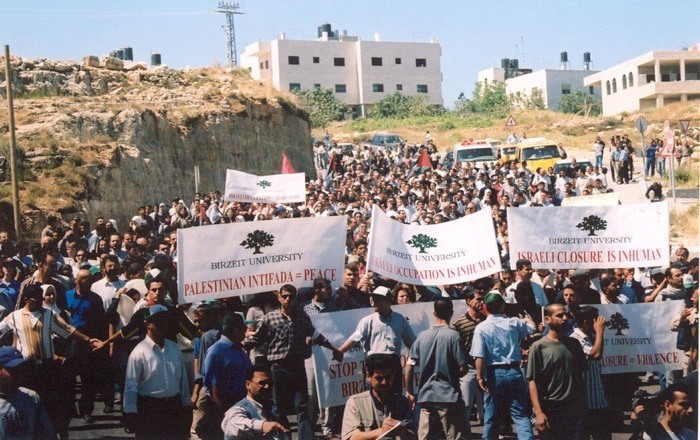 During its early years, Fobzu supported Birzeit University by raising awareness among the UK academic community about the difficulties of education under occupation, fostering cooperation between UK universities and Birzeit and campaigning on the treatment of Palestinian students and academics by Israel’s occupation authorities. Fobzu organised guest lecturers and delegations to visit occupied Palestine to demonstrate the solidarity of UK academics with their Palestinian colleagues. Among the many who visited occupied Palestine were the historian Eric Hobsbawm (who later became a Fobzu Patron) and the Nobel-prize-winning scientist Dorothy Hodgkin. The novelist and philosopher Iris Murdoch was one of a list of academics who volunteered to lecture in Palestine, although in her case, she was unable to undertake the trip. Fobzu published pamphlets providing important information on the impact of measures taken by the occupation authorities against Palestinian academic freedom such as Military Order No. 854, which gave Israel full control over the students that universities admitted and the staff they employed. The committee also devoted energies to raising funds for teaching materials and hosted educational and cultural events in the UK on Palestine and Palestinian education. The challenges facing Palestinian education today under occupation and in exile are arguably even greater than they were when Fobzu was established 40 years ago. The expansion of university education in occupied Palestine is a source of hope, but students and teachers still face major obstacles. Palestinian higher education suffers international isolation, and the fragmentation of Palestinian geography associated with the blockade of Gaza, the Separation Wall, the isolation of East Jerusalem and the system of divisions within the West Bank undermine Palestinian educational life. Meanwhile, Palestinian refugees outside Palestine reside in various states of educational deprivation. Responding to these challenges, Fobzu’s mandate and programme has evolved. While retaining an historic link with Birzeit University, today Fobzu works with Palestinian academics and students at universities inside and outside Palestine. Fobzu’s scholarship programme supports students at Birzeit as well other universities in the West Bank and Gaza Strip. We have also supported capacity-building initiatives such as the Mental Health Counsellor Training project organised in partnership with the Centre for Continuing Education at Birzeit and financed by a grant from the Big Lottery Fund. Fobzu campaigns on the right to education for all Palestinians and works to foster greater understanding in the UK about the challenges facing Palestinian education and the struggles of students and teachers to overcome them and transform their lives. Photo taken in a recent Fobzu event, about "Access to Education and Dignity for Palestinian Refugees"